The Hubble Space Telescope has snapped a striking view of bright and beautiful cosmic clumps in the constellation of Taurus. Image released Nov. 6, 2014. A haunting landscape of star systems, bubbles, and shock fronts lies toward the constellation of Taurus in an amazing photo taken by the Hubble Space Telescope. Perhaps the most striking feature of the Hubble Space Telescope view is an apparent star embedded within a rust-colored cloud, toward the upper left corner. Although the bright spot, better known as XZ Tauri, appears to be a single star, it's actually a binary star system with one of those two stars also a binary system, making a total of three stars within a single system. The cosmic objects are located about 450 light-years from Earth. A hot bubble of gas can be seen as the small orange lobe very close to the top left of XZ Tauri. It's speeding out from the star system, leaving an imprint spanning tens of billions of kilometers. As the gas travels, it hits slower moving material, and the shock of impact triggers pulses of light. 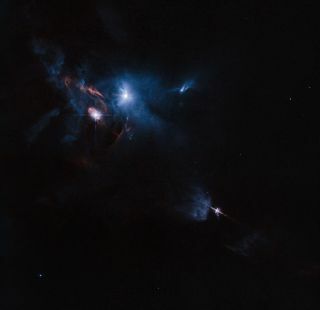 A similar phenomenon is occurring above and to the right of XZ Tauri, where wisps of deep red can be seen embedded within the blue clumps. The bright blue patch contains a young star known as HL Tauri. When narrow gas streams from the newborn star hit an interstellar cloud, the shock of impact lights up the target, a sight better known as a Herbig-Haro (HH) object, according to a Hubble mission statement. In the bottom right of this Hubble image is another Herbig-Haro object known as HH 30. Although the source is hidden from view, its reflected light and prominent, knotty jets can be seen blasting out into space. A version of this image won third prize in the Hubble's Hidden Treasures image processing competition. Follow Shannon Hall @ShannonWHall. Follow us @Spacedotcom, Facebook and Google+. Original article on Space.com.